Quartetto di Venezia. Try not to think of Reservoir Dogs and the song 'Little Green Bag' when looking at this photo. THERE WILL be a strongly Italian flavour to the next Music For Galway concert when the world renowned Quartetto di Venezia perform in St Joseph’s Church. This will be quartet's first show in Galway in a decade, and will see them play Boccherini's String Quartet Op 52 No 3, Malipiero's 'Rispetti e Strambotti', Verdi's String Quartet in Em, and Mozart's String Quartet KV 499. The Italian connection with the latter is that, during his teens, Mozart travelled three times to Italy with his father, later visiting Venice as an adult. 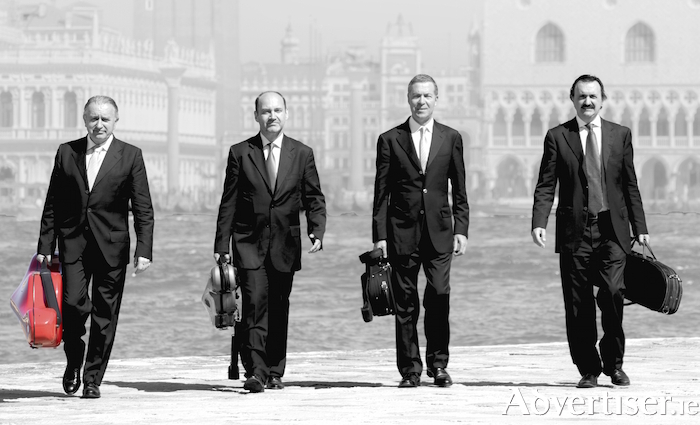 The quartet has played across the world and has released 19 albums. The renowned viola player Bruno Giuranna said of them: "This is a group that stands out in the varied and vast European musical field. The perfect technical mastery and the power of their performances, characterized by the push towards an absolute value of themselves as true performers, place the Quartet of Venice at the top of their category and among the very few worthy of taking over the role of the great quartets of the past." Quartetto di Venezia play St Joseph’s Church, Presentation Road, on Wednesday February 20 at 8pm. For tickets contact Music For Galway (www.musicforgalway.ie, 091 - 705962 ) or O’Maille’s Original House of Style, Shop Street. Page generated in 0.0920 seconds.